Reduce the CO2 and NOx emissions by increased aerodynamic performance because structurally integrated antennas cause less additional drag, noise and turbulence than protruding antennas and by facilitating the use of CROR engines. 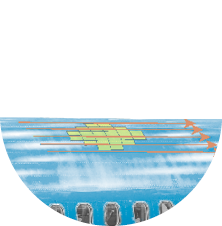 Reduce the overall airframe weight by eliminating structural build-ups and support structures required for conventional antennas and by integrating and miniaturization of sensors and actuators which are required in future aircraft to reduce cabin noise due to CROR engines by up to 8 dB in the first five CROR frequencies. 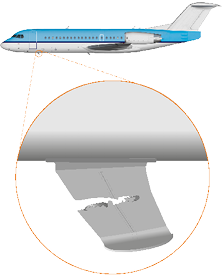 Reduce the maintenance costs and operational delays through integrated antennas, sensors and wiring (avoiding to protruding blade antennas caused by collisions with airport cargo cars), and through antenna apertures on fuselage panels with access to antennas from the cabin and trough increase robustness of integrated antennas. Classical antennas are sometimes damaged due to collisions with ground cargo, and then require replacement. The structural integration of antennas and wiring will reduce replacement and inspection costs. Protruding blade antennas are causing additional drag and turbulence, aerodynamic resistance and increased fuel consumption. 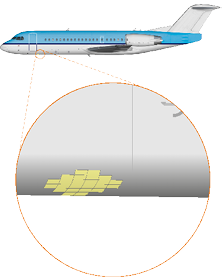 Carbon fibre composites and metal laminate materials integrated in the structure of the fuselage will have greater stream-lining of the fuselage, with low aerodynamic resistance and a significant reduction in weight.